GENUINE VW RC310 DAB RADIO CD MP3 PLAYER. PN: 5M0035186L. Vauxhall Astra/Zafira CD70 and CID. Condition is Used. Dispatched with Royal Mail 1st Class. AUDI A3 8P SYMPHONY II RADIO CD PLAYER CASSETTE HEAD UNIT 8P0035195. Condition is Used. Dispatched with Royal Mail 2nd Class. Ensure this is the correct radio for you. Tested and working. YOU ARE BUYING PEUGEOT 207 307 CITROEN C3 RADIO CD PLAYER RD4N1 WITHOUT CODE. Sony MEX-N4100BT Bluetooth CD MP3 NFC USB Aux-In iPod iPhone Car Radio Stereo. Condition is Used. In excellent condition; requires a radio antenna adaptor. Just removed from my motorhome as I have fitted a new GPS unit. No box but the unit will be securely packaged. Dispatched with Royal Mail 2nd Class. Kenwood KVT. unit 1. Kenwood KVT-925DVD - DVD receiver - display 7 in - in-dash unit. Diagonal Size. Just removed from my car. CD-R, CD-RW, DVD R, DVD RW, Video CD. AV receiver with TV tuner. Tuner Bands. Audi TT Mk1 98-06Concert CDplayer*Radio*Headunit*. Condition is Used. Dispatched with Royal Mail 2nd Class. 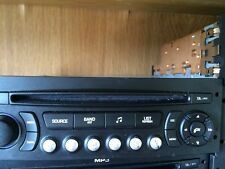 2004-08 SEAT LEON MK2 FM RADIO STEREO CD PLAYER HEAD UNIT 1P2035186AN87. Condition is Used. Dispatched with Royal Mail 2nd Class. Please note radio requires radio code which is not supplied, code can be obtained from Seat Dealer. RENAULT CLIO CD RADIO PLAYER. WORKS WITH RADIO DISPLAY WHICH SITS ABOVE THE RADIO IN THE DASHBOARD. DIFFERENT CD PLAYER. All stereo are tested thoroughly security marked internally and security labelled externally. FORD 6000 CD RADIO PLAYER. HAS THE CDDJ BUTTON NOT THE AUX BUTTON TOP LEFT AS YIOU LOOK AT THE CD PLAYER. I CLASS MY UNITS AS REFURBISHED BECAUSE I SERVICE THE UNITS TEST THEM AND DECODE THEM. SUPPLIED WITH SECURITY CODE. Network: Support 2.4G Wifi（not support 5G Wifi）. Product System: Android 8.1. Support Radio function and built-in AUX input.4. Radio band: FM1/FM2/FM3. Radio chip: SI4730. Play mode: USB / Bluetooth (password 0000 or 8888). Does not require a code. Beep: On/Off. - Bluetooth: Auto Answer: On/Off, Auto Connect: Yes/No. - EQ Setup: Support the newest 10-Band EQ. - A2DP (Bluetooth Stereo Music): Yes, can play stereo music through Bluetooth. - Front panel Size: 176mm(Top width) 50mm(High) 176mm(Bottom width). SONY mex-bt2900 car stereo cd radio player mp3/auxin/Bluetooth. Radio fm/mw/Lw tuner rds. Bluetooth, Wireless Audio Streaming-A2DP. built in BLUETOOTH handsfree calls. compact audio discs. manual can be free download here's link. FORD Kuga 2008-2011. 7"All-in-One Design for old FORD Cars. Adopt the newest Android 8.1 Oreo OS, 1024 600 HD Capacitive Touch Screen, Quad Core 1512MHz CPU, 2GB RAM and 16GB Internal Storage, Support extended 2 Card/2 USB Stick up to 4 64GB. IF YOU NEED ONE YOU WILL NEED TO GET ONE. NOT SURE OR YOU NEED A CODE. PART NUMBER. : A2038275242. With Original Sat disc. Looks New! In Excellent Conditionfor the age. BMW E87 Business CD Stereo Head unit. Condition is Used. Dispatched with Hermes Tracked. Renault twingo II. this car radio is original for Renault twingo 2. front aux input for iPod/iPhone/smartphones/other mp3 players. it excellent condition. 2015 Ford Transit Custom radio head unit. In good clean condition. Please study the picture as this is the item you will receive. Can collect if you wish. Hizpo 1 Din Head Unit, 7" touch screen. Radio : FM/AM, RDS,DAB (optional). WIFI: Built in. OS: Android 8.1 System. WiFi Antenna. Mirror Link: Yes, AirPin(PRO) for iphone and Easy-Connect for Android phone. You will find the serial number either printed on a label or you can press the buttons 1 & 6 or 2 & 6 on the front of the radio for a second or two, text will scroll along the display look for the serial number beginning with V.
Ford Transit Focus Kuga S/C-MAX Galaxy Support :FORD Focus Kuga Fiesta Transit Galaxy Mondeo 2004-2006 IMPORTANT NOTE : 1. This unit has front panel size 230mm(Width)*120mm(High), please check your dashboard size and make sure your car dashboard is same as the dashboard phote in our listing before bidding. 2. This unit does not support decoding air conditioning information. 3. This unit does not support original voice control and reverse sensor function 4. This unit does not support original Sync function 5. This unit incompatible with mondeo mk3 2005. Clever technology will even switch from DAB to FM (and back again) if there is a local signal problem. Ford mondeo mk2 1996 To 2000. Ford Mondeo Mk3 2001 to 2003 prefacelift. All Ford Focus mk1 1998 To 2004. ford 6000 CD RDS EON. Cd changer compatible (if required). Cd and radio stations work fine. Once the 4 digit code has been correctly selected on the radio's display screen press button 5 to enter it and that’s it done. Audi car radio code service for all CD & Sat Nav Systems, incliding RNS-E Plus, Concert 1 & 2, Symphony, Chorus Etc. Audi Radio Decode In Minutes Service. ★ The DVD is installed in the standard car-mounted position of the original car dashboard. ISO double din mounting size. PLL Synthesized Electronic Tuning Stereo FM1/FM2/FM3 and High Sensitive AM1/AM2 tuner. Car Radio sony Stereo Player MP3/USB/SD/FM In-dash IPod . Condition is Used. Dispatched with Royal Mail 2nd Class. VW RCD300 CAR STEREO RADIO CD PLAYER - GOLF MK5, PASSAT, JETTA, CADDY, TOURAN. Condition is Used. Dispatched with eBay delivery – Shutl 1 day. Before we dismantle parts from a car, we check the functionality to ensure that the parts are in good working order. FOR OTHER AREAS SUCH AS Channel Islands, Isle of Wight, Isle of Man, Scilly Isles, Scottish Highlands, Scottish Islands, Northern Ireland. This has been in a classic car and has had very little use, it really is still like new. It does not have it,s mounting cage or removal keys. THIS UNIT PLAYS STANDARD CD's AS WELL AS MP3 WMA & WAV FILES, ALSO FEATURING AN ILLUMINATED AUX-IN PORT CD RDS TUNER. MAX POWER OUTPUT MOSFET 4 X 50W ( 200W ). FM / AM RDS TUNER ( 24 PRESET CHANNELS ). MODEL CD413X. ROVER CD RADIO PLAYER. FITS VARIOUS ROVER MODELS. FITS GOLF PASSAT TOURAN CADDY SCIROCCO AMAROK. VOLKSWAGEN CD RADIO MP3 PLAYER. PLAYS MP3 COPY AND ORIGINAL CDS. SUPPLIED WITH SECURITY CODE. IN FULLY WORKING ORDER UNIT HAS BEEN SERVICED. Beep: On/Off. - Bluetooth: Auto Answer: On/Off, Auto Connect: Yes/No. - EQ Setup: Support the newest 10-Band EQ. - A2DP (Bluetooth Stereo Music): Yes, can play stereo music through Bluetooth. - Front panel Size: 175mm(Top width) 50mm(High) 175mm(Bottom width).